A Perth youngster has officially marked the end of her cancer treatment almost two years after being diagnosed with a rare condition. Lily Douglas has been battling stage-four Ewing's Sarcoma, but her latest scans have revealed she is "cancer free". 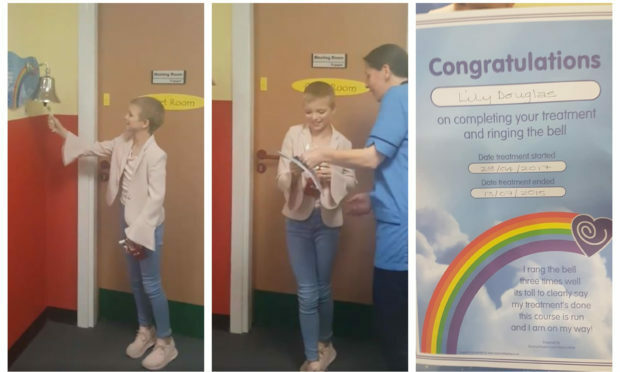 On Monday her mum Jane Douglas shared a video and photos of the young dancer ringing the "end of treatment bell" at Ninewells Hospital – 493 days on from her diagnosis. Posting to Facebook Jane said: "Well she done it 493 days after being diagnose(d) with a stage 4 rare bone cancer LILY HAS FINALLY RUNG THE END OF TREATMENT BELL. "Delighted is an understatement, granny and granddad came to hospital to see her, such a lovely day." Earlier this year Lily went on a 10-week trip to Florida where she received proton beam therapy in an attempt to eradicate Ewing’s Sarcoma. In early July, Lily took centre-stage as she performed a poignant ballet sequence at the Cancer Research UK Kids and Teens Star Awards party in London. Despite her tender age, she has already garnered 90 trophies and 200 medals in ballet, tap, and street and modern dance. Lily has undergone 14 rounds of chemotherapy, nine operations and fought off seven infections. Speaking in July, Jane said: “I’m blown away by Lily’s courage and strength. Lily has made broken look beautiful and strong look invincible. I couldn’t be prouder.